Eric is a Senior Partner and seasoned trial lawyer. 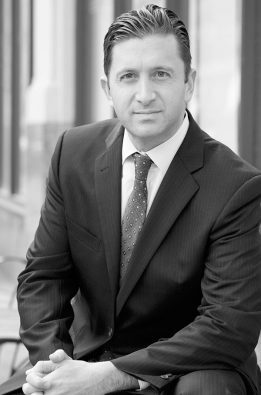 Eric co-founded Calcagni & Kanefsky following years of experience as a Federal prosecutor, as the Director of New Jersey’s Division of Consumer Affairs, and as a litigator of high-stakes civil cases at large law firms in New York and Philadelphia. Eric’s practice is exclusively dedicated to representing corporations and individuals in complex litigations, particularly ones involving government and regulatory issues, the healthcare and securities industries, and high-stakes civil disputes. He regularly defends his clients against investigations and actions commenced by the Department of Justice, the Offices of State Attorneys General, and other government entities. Eric brings to bear for his clients a wealth of public and private sector experience from his service as a high-ranking law enforcement official in the Office of the New Jersey Attorney General, as a Federal prosecutor with the United States Attorney’s Office in New Jersey, and from years in private practice at one of the nation’s most prestigious plaintiffs litigation firms. Immediately prior to co-founding Calcagni & Kanefsky, Eric served as the Director of the Division of Consumer Affairs for the State of New Jersey, a 600-person civil law enforcement and regulatory agency within the Office of the Attorney General. Eric was nominated by the Governor and unanimously confirmed by the State Senate to that position. In his capacity as Director, he was responsible for regulating the State’s securities and healthcare industries and overseeing the prosecution of hundreds of consumer fraud and professional misconduct cases. Under his leadership, New Jersey became one of the most proactive states in pursuing actions involving internet data breaches, online privacy violations, and other internet-related violations. Prior to his appointment as New Jersey’s Consumer Affairs Director, Eric served as an Assistant United States Attorney in the District of New Jersey. Eric was elevated to the U.S. Attorney’s elite Special Prosecutions Division where he investigated, prosecuted, and tried to conviction numerous white-collar offenses, including public corruption and complex commercial fraud matters. Before his public service, Eric worked in private practice at renowned law firms in New York City and Philadelphia, including almost six years at one of the country’s preeminent plaintiffs litigation firms. While in private practice, he litigated securities fraud and complex commercial disputes on behalf of plaintiffs and defendants. Eric helped investors recover hundreds of millions of dollars in settlements; defended individuals and companies against various government enforcement actions; and conducted internal investigations for Fortune 500 companies. Eric has successfully represented plaintiffs and defendants in securities fraud, auditor malpractice, corporate governance, contractual, and employment disputes, and in litigation on behalf of creditors of distressed and bankrupt entities, among other matters. Successfully represented one of the nation’s largest investment banks in response to a multi-year investigation by the New Jersey Division of Consumer Affairs and Bureau of Securities; the case was ultimately closed without further action. Representing a private university in securing necessary approval from the New Jersey Division of Consumer Affairs and State Board of Medical Examiners to open the State’s first private medical school. Defending an investment fund against consumer fraud allegations brought by the Consumer Financial Protection Bureau and New York Attorney General. Successfully obtained deferred prosecution and eventual dismissal of a physician charged with accepting bribes and kickbacks by New Jersey’s Insurance Fraud Prosecutor. Defending the former Chief Executive Officer of a fragrance company against federal trade-based money laundering charges by the U.S. Attorney’s Office arising from international commerce. Representing the Chief Executive Officer, other senior executives, and board members of a banking institution in a federal fraud investigation conducted by the FBI, FDIC, and U.S. Attorney’s Office. Represented an employee of a national environmental testing laboratory in a false claims investigation conducted by the New Jersey Attorney General. Represented a regional telecommunications company in connection with U.S. Department of Justice fraud investigation. Defended a Chief Executive Officer against securities fraud charges by U.S. Attorney’s Office. Represented a brand-name retailer in a U.S. Department of Justice money-laundering investigation. Routinely represents physicians, chiropractors, dentists, and other regulated professionals in response to inquiries and actions brought by state professional licensing boards and private injury protection insurance carriers. Recovered over $9 million on behalf of investment fund in breach of contract action arising from private investment. Successfully defended large publicly-traded energy conglomerate against multiple shareholder securities fraud lawsuits. Represented multiple high-level employees in response to internal corporate investigations by their former employer, one of the largest private companies in the United States, and negotiated favorable severance packages. Defended one of the nation’s largest retail pharmacies against multiple civil class action lawsuits alleging violations of Telecommunications Consumer Protection Act. Recovered over $10 million on behalf of a publicly traded-company in affirmative actions against their outside counsel, underwriters, and insurance carrier for negligence in connection with the company’s public bond offering. Served as outside general counsel to the court-appointed trustees, including a former New Jersey Supreme Court Justice and Appellate Division Judge, during the dissolution of the Newark Watershed Conservation and Development Corporation. Routinely serves as outside general counsel for small- and mid-sized companies based in New Jersey and New York on wide-ranging legal matters. Eric routinely speaks on emerging issues and cases affecting his clients and has appeared in television and print media numerous times for his work.